Late summer is a busy season at my parent’s house. The apple trees are loaded with apples and the fig tree has my mother scrambling to find people who like figs. If it’s fig season and you’re meeting my mother for the first time, right after “nice to meet you” you’ll hear, “do you like figs?” with a look of hopeful anticipation. Mom can never find enough neighbors, friends, ladies at the exercise class to give figs to so she dries and freezes some, and with others makes a wonderful fig microwave jam. That, my friends, is the way my mother makes jams. She learned this technique years ago from Sunset Magazine (1979) and never looked back. Now that I’ve finally tried her approach, I can see the appeal. You make only small batches—a pint at a time—enough for your own use in most cases, and it takes all of 15 minutes of cooking time. Since we make only 2 small jars and we use them up quickly, there’s no need to sterilize the jars, just use clean jars that have been rinsed, and put the jam in refrigerator after it has set. This spicy, orange-y fig jam is a cinch to make. We used mild green figs because we grow them, but you could easily use the darker Mission figs. The jam is a wonderful dipping sauce for nutty cheeses such as Gruyere. 1 Macerate fruit in sugar: Place the ingredients in a large ceramic or glass bowl or casserole (we use a 2-quart pyrex measuring cup), stir to combine, let sit for 30 minutes for the fruit to macerate in the sugar. 2 Cook in microwave: Place in microwave. You will cook the fruit mixture on the high setting for approximately 15 minutes. As soon as the mixture starts to boil, after about 6 to 8 minutes, stop the cooking and stir. Continue cooking and stir every few minutes. At about 13 minutes the mixture should start to get viscous. If you spoon out a bit on to a small plate that has been in the freezer, you can push the mixture around a bit with your finger tip to see how thick it is. If it is runny, cook it a couple minutes more. You can also check by seeing how the jam runs off of a spoon. If it seems to firm up a bit as it drips, it's done. 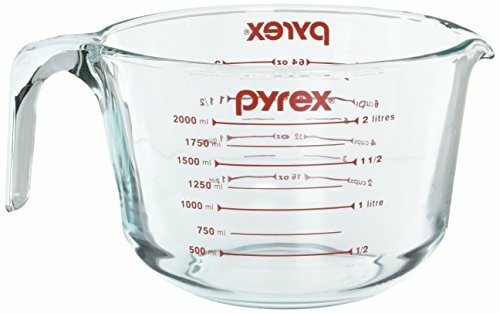 If you use a large pyrex measuring cup as we have done here, you can see that you start with close to 3 cups of liquid. You want to boil it down to 2 cups. 3 Pour into jars: Pour out the jam into jars, leaving 1/4-inch of headroom from the top of the jars. If you want to keep your jam in a cupboard, then use sterilized jars (heat them in the oven at 200°F for 10 minutes). If you plan to eat up quickly and will keep them in the refrigerator, regular clean jars will do. Hello! All photos and content are copyright protected. Please do not use our photos without prior written permission. If you wish to republish this recipe, please rewrite the recipe in your own unique words and link back to Easy Microwave Fig Jam on Simply Recipes. Thank you! This is a wonderful recipe. I did it first in the microwave and loved it, so I then made a big batch on the stove. Do you think this would work with mandarins? Hi Cindy, do you mean using a microwave to make mandarin marmalade or something like that? It’s worth an experiment! I would soak the mandarins overnight in water first, before cooking. I also use the microwave to make a strawberry jam that’s very good. I’m so excited to try this recipe! Do you take the skin off the figs first? or just dice them with the skin attached? (Im a beginner!) Thank you! Hi Jess, no need to take the skins off the figs. Have fun with the recipe! Hi, Lenette! Emma, managing editor for Simply Recipes, here! Yes, you can do this on the stovetop, though the timing will be different. I’d keep a close eye on it and stir the jam every few minutes. Once it starts seeming “jammy”, start checking the consistency using the spoon test that Elise talks about in Step 2. Enjoy! Thank you so much for posting this recipe…so much fun to make and such a time saver. My Mama, who taught me to can, would have loved it. I made one batch with orange per your recipe. The second batch I used lemon and omitted the spices. Wow! Can I use dates with this recipe? You mean dates instead of sugar? Or dates in place of the figs? In either case I don’t know. If you experiment, please let us know how it turns out for you! Such a wonderful recipe! My family loves your figgy jam, even the self-professed fig haters ;-) Thanks so much for sharing. I love this!! Last year I cooked mine on the stove and it tasted ok. This recipe is easy and is the best tasting fig jam I’ve ever had.My jam cooked in exactly 13 min. I stopped it every 4-5 minutes and stirred it well. Just can’t seem to get this to thicken up, it is greatbut, alittle watery. what to do? It should thicken as it cools. Had some figs in the fridge about to go south, so googled fig jam hoping to find something easy and quick with ingredients on hand. Of course everything I found at first was typical canning methods with huge quantities of figs. I had seven! Then I read your recipe and it’s perfect. I only had 1 cup of figs diced so I adjusted the qtys accordingly. It’s now sitting in a pyrex bowl cooling, we licked the spoon and can’t wait for tomorrow’s toast & fig jam. Never bothered to look to see when it was posted, can’t believe how old this is and how perfect it works! Thanx for sharing as always! I love this!! Last year I cooked mine on the stove and it tasted ok. This recipe is easy and is the best tasting fig jam I’ve ever had.My jam cooked in exactly 13 min. I stopped it every 4-5 minutes and stirred it well. The pictures were great to have to show the thickness of the jam if it has set right.The only other extra ingredient I added was some finely chopped walnuts.I could’t wait to make some toast have some of this jam.The color is beautiful and the smell is wonderful. I will probably make this Christmas presents.Thank you so much for sharing this. Well, you have a convert! I hate raw figs! !We have a giant fig tree here in our garden in Spain. Every year my poor husband eats as many as he can, or we try and give them away. This doesn’t always work as many Spanish people have a fig tree. But after browsing and finding this recipe you can guess where all the figs are going! Now the trusty old microwave gave up the ghost a short while back, so I have to use the stove top. Obviously it takes longer to cook, but it’s only a case of waiting and testing to see if it has set. So far I have made 12 jars, we have stored them away for the winter months, although the mother in law is enjoying hers! More figs are ripening daily, so I think I shall have to get round the market for some oranges, lemons I have growing too. Note to self; plant orange tree!. The orange trees you see on our streets are the large thick skinned bitter oranges, no way could they be eaten raw, so we use them for Seville Marmalade…oh one minute I shall just go round the square and get a couple of those instead! Thank you very much for this recipe Elise,and making me love figs so much, I shall be trying out some of your others too. We have a small fig tree in our yard that my husband planted just a couple of years ago. This was the first year that it has set fruit. Since it is small just a few figs have ripened at a time. This recipe was just perfect! I have made four batches so far to use up the fruit as it ripens and hope to use this technique for other fruit jams as well. Thank you and your mother for sharing this. Oh I forgot to say…I always double the batch and it turns out great. Takes just a tad longer to cook but it works. This is wonderful and I have been using it since I found it several years ago. I too have played around with the recipe using what I had on hand. I have used crushed pineapple instead of orange, lime zest and juice instead of lemon, used combo of pears and figs with cinnamon and cloves, figs and chopped dried apricots and figs and cranraisins and more. But I think my all time fav, being from Tx, is the Lime Jalapeno Fig…omittimg the spices using lime juice and chopped jalapeno…more the better. I have put on ribs and pork…delish. Love, love, love this recipe. Thanks for sharing! Just got through making this jam. It is wonderful! Will be making again real soon! My friend gave me some figs off of her fig tree. I just tried this recipe this morning, although I made it on the stove, and it was divine! My husband kept raving about how it was the best jam he had ever had and he doesn’t even like figs. This was my first attempt at making fresh jam and thia recipe was so simple and easy. I cant’t wait to try more. Thanks for this delicious recipe. My next door neighbors have a fig tree and they have graciously allowed me to pick all that I want. I was looking for a quick jam recipe and this one filled the bill. And, to make it an even better find, IT’S DELICIOUS. I forgot to put lemon in first batch and it is quite good but a little too sweet for me. Next batch added lemon juice and it is perfect. Thanks for sharing this recipe. This is the very first time that I have ever made jam. We have a fig tree, haven’t done much with them before apart from making deserts. Saw your recipe & thought it was interesting, nice combination, never thought that could use the microwave to make jam. Your recipe is just so good, love the taste. I did a few jars as per your instructions and also put the ingredients through a food processor after letting it sit for the half hour. Thank you. How about adding hot spice, like a pinch of chili flakes to add some zing? Would this ruin the jam?